Be Heard! 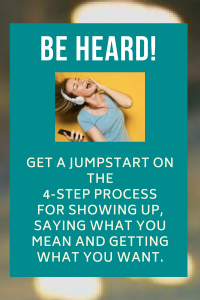 Get A Jumpstart on 4-Step Process for Showing Up, Saying What You Mean and Getting What You Want. This audio was designed to help you start making progress towards better communication. Includes a 10-page workbook with an outline of the process and exercises to help you follow-through.